Planning For Energy, Asking the Questions. As I prepare for the Superior Hiking Trail I find myself more anxious than ever thinking about my nutrition choices. A regular hiker can go mad just trying to add the daily numbers between calories, weight and cost. When i started my AT thru-hike I had one solid pound of Jolly Ranchers (they were on sale!) and a loaf of regular bread stuffed into my bear vault among other embarrassing choices. Stupid determination kept me going and I learned invaluable food lessons from my fellow hikers but is there a different planning method to consider? Half Gallon Challenge at Pine Grove Furnace SP. 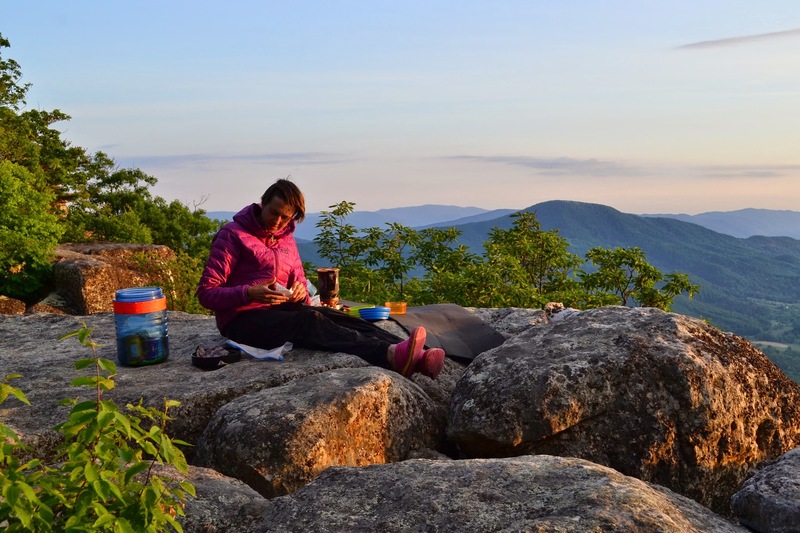 Outside Magazine reports that the average thru-hiker burns approximately 5,000 calories per day. The equivalent of Nine, you read that right, NINE packages of Mountain House Chicken Teriyaki(1). But does this include the calories your body continues to burn throughout the night? The after-burn effect or ‘Excess Post-Oxygen Consumption’ (EPOC) shows that your body is still trying to regain oxygen after intense activity. As a hiker in ‘post-workout mode’ you’re still burning calories into the night(2). Most athletes are able to workout and then relax. They can give the Big Game their all for a half day and then go about the non-active side of life again. 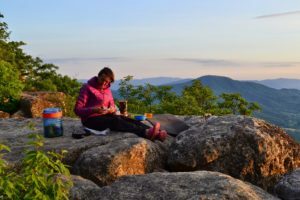 Thru-hikers are all day, every day. Even on town days, I still found myself walking to the grocery store, the laundromat, and sometimes more! Where is the recovery time? 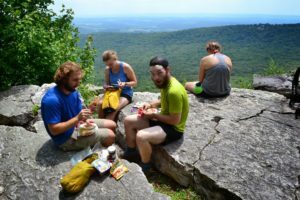 Can thru-hikers even fathom a food plan that would account for the longevity of calorie burn time? 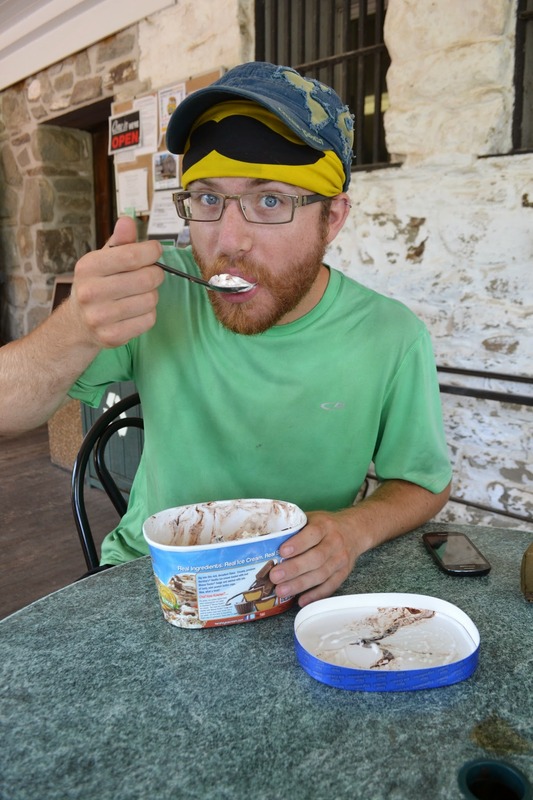 In my nervous food planning stage I chatted with 2015 thru-hiker, Muffin Man. I shared with him my feelings of anxiety over not having the right amount of food again. “How do you even begin to count calories? I don’t want to experience the same physical wasting I had on the AT,” I told him. He laughed and said, “I planned to burn approximately 3,500 calories a day hiking. So I wanted my intake to equal my output. But when I tried to eat the 3,500 calories a day I had packed, I physically could not do it. I simply couldn’t eat that much.” He then offered me some of his many trail leftovers. This conversation left me with the frustrating question, if I can’t consume enough, does counting calories matter at all? Perhaps I should instead focus on maximizing the calories I can consume? What does it even mean to maximize calories when you’re resupplying at a gas station? Ultra runner and recent AT speed record holder, Scott Jurek is on a completely vegan diet. He has shattered records and thrown previously held notions of what an athlete should eat out the van window. Despite his thorough knowledge on diet for long-distance activities, even he experienced what I would consider a huge physical deterioration. “…I lost almost 20 pounds” he tells Bon Appetit magazine, “I was on the trail for 13, 14 hours a day at first…Sometimes 20. I was getting less and less sleep, and my metabolism was just raging. I needed to consume 7,000 calories or more a day. A lot of that- around 3,000- of that was in Clif products”(3). I met the man himself two days ago and that guy is a serious lean muscle machine. Losing 20 pounds would be all muscle loss. Something most hikers can’t afford once they get further north. Wait a minute, let’s go back to that last quote. Clif products? I know Clif has a lot of different nutrients and flavors going on, particularly in the protein department and their delicious macadamia deal. But almost half of your calories coming from Clif products? I don’t think I could do that for an entire trail at a mere mortal pace. I don’t think that could be considered maximizing your calories either. 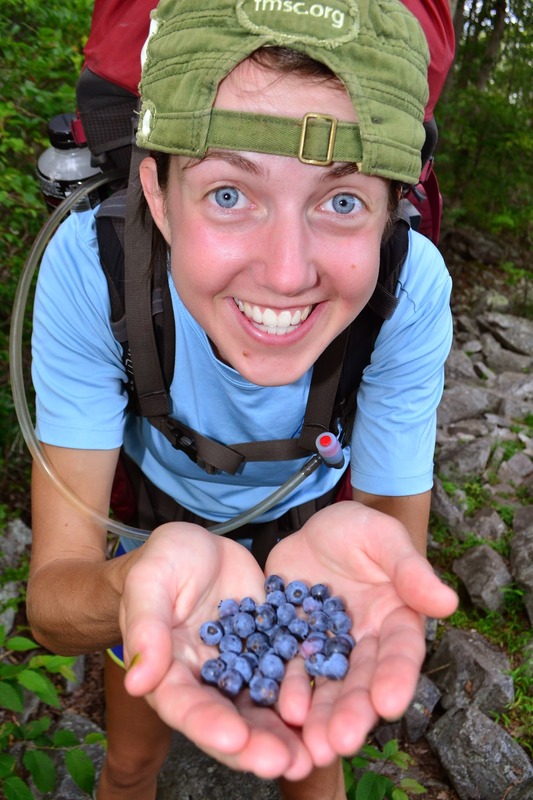 If Scott Jurek loses to the AT calorie war, then what hope do we average hikers have left in our bear vaults? Despite these many questions regarding nutrition, I am going to tackle this next trail with good intentions and I suppose some Clif products. Over the next month I hope to connect with various sources in the athlete nutrition world. Does it take a full on science degree to create and understand a ‘successful’ AT food plan? What does a successful food plan even mean? Maintaining weight? Adding muscle? Survival? 1. Bethea, Charles. “You Want Fries With That?” Outside Magazine, July 2016, 28. 2. Tao, David. “How to Keep Burning Calories When Your Workout is Over”. Greatist.com, January 18, 2016. 3. Bilow, Rochelle. “This Man Ran the Entire Appalachian Trail in 46 Days. Here’s What He Ate Along the Way”. Bon Appetit Magazine, August 17, 2015. Thanks for the advice. I am planning on section hiking the Superior Hiking Trail over this fall and next year in preparation for an AT thru-hike in 2018. The parts I have already hiked are beautiful.